This year four bikers from Klaipeda, Lithuania, Aleksej Morozov, Aleksandras Kuzinas, Igor Ivanov and Konstantin Baskayev decided to ride 805 km in 12 hours during participation in a local action “1000 km of Hope” Donation Project of St. Francis Cancer Support Centre. During the trip volunteers go to a lot of cities of Lithuania and meet different people, spread information, and collect donations to financially support St. Francis Cancer Support Centre. 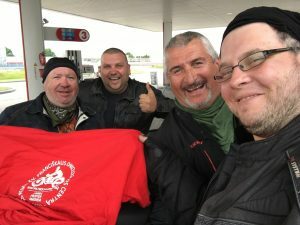 “1000 km of Hope“, is a project of volunteer motorcyclists who unite warm-hearted people, who enjoy their life and help others to enjoy it. Every one of us has experienced moments when our loved ones face serious illness. During such moments their spiritual support and rehabilitation is a matter of great importance. This project of kindness is a fight against serious challenges of life. St. Francis Oncological Centre is a pioneering spiritual and psychosocial service oncological centre that unites cancer patients, their relatives, friends and those who have already lost family members. Information and support services provided by the Centre are free of charge to every patient and their relatives. No Replies to "1000 km of Hope"